TiS 679 / Online God of Jeremiah grieving (Wren) If you are going to focus on Jeremiah for the next few weeks, this would be a good hymn to learn. The traditional Scottish tune KELVIN GROVE is well known as the tune for "The Summons". 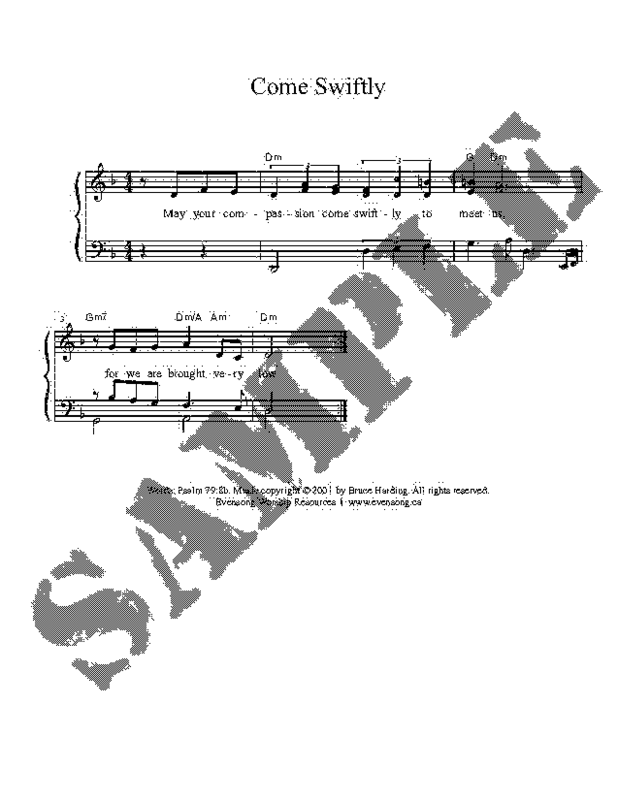 Lyrics and free sheet music PDF. NCH553 / UMH375 / VU612 / WoV737 / ELW614 / HPP379 / GtG792 / PH394 / G(II)460 / GC648 / GC(II)617 / G(3)640 / W&R631 / Cha501 / ZSS114 / SgTJ1045 / 82Hml-676 There is a balm in Gilead (African-American) "If you cannot preach like Peter, if you cannot pray like Paul". This song is not so meaningful for Australians, but I know it is for Americans. It's a good one for those who feel discouraged about anything magnificent happening in their life of faith. Choral arrangement sound sample. Oldy-but-a-goody. Tune In: Our God who weeps (Kate Scull) Very simple folk-like tune and challenging and hopeful lyrics. "When death has taken those held dear"... Reference recording, lyrics and songbook available here. Traditional / ATA 124 / SLW42 / UMH494 / GtG472 / PH338 / W&R487 / Cha590 / PfAS079A Kumbayah, my Lord. I think this song is really beautiful sometimes. Sometimes it’s really awful too, unfortunately. I was lucky enough to sing this with Trish Watts and our congregation at Paddington Uniting Church many years ago as a quiet meditative chant, with improvised descants, which totally transformed this song for me. You can judge whether it will work for your congregation. You could also sing "Come by here, my Lord" too. Wish I could find a nice sample for you, but can't. Oldy-but-a-goody. Tune In / NCYC '07: Forgive us now (Brown). “As we forgive may we be healed, as we reach out….” An excellent ballad seeking forgiveness in a sinful world. Lyrics, sound sample and songbook. *MV064 Because you came (Murray) Powerful words of confession and forgiveness, sung to a lovely tune that will need to be taught, but will not be hard to teach. It has 5 verses, so maybe invite the congregation to join in as they hear it. Iona (LFB) Listen Lord (Iona / Bell) Beautiful chant-like chorus, can be used on its own or as a response, or used with the verses. Good to use for the intercessions. *PH437 / CP591 / W&R586 Our Cities Cry to You O God (Clarkson) Good words of helping to heal injustice in the world. Being the body of Christ. Sung to a very familiar hymn tune. Lyrics and tune sample. Online resource May your compassion come quickly (Harding) A simple Psalm refrain. Sheet music sample. Purchase here. Emergent Psalter How long O Lord? (Everett) A simple, but interesting refrain. Sheet music sample. The endless grind of commerce; Turning feasting to mourning, a famine of God’s word. AA085 Let justice roll down like a river(Gibson) Excellent song, and very easy to sing. Lyrics. Sheet music. Good for kids. StS033 / GA515 / G(II)516 / GC716 / GC(II)709 / G(3)810 Let Justice Roll Like a River (Haugen) Verse 3 of this song is particularly appropriate for this passage. The song is quite simple, particularly if you use a soloist for the verses if this is new to you. Sound sample (I don't like this sample much) and sheet music sample and lyrics. TiS 689 / ATE 286 / GtB Lord hear my praying, listen to me / Sorrowing song. (Mann) Powerful words of prayer to a simple tune. Words are straightforward about asking difficult questions of God. Lyrics. This song will also work for next week, so now is a good time to introduce it. NCH593 / UMH519 / LBW562 / ELW841 / HPP304 / GtG339 / PH563 / W&R729 / Cha631 / ZSS113 / 82Hml-599 Lift every voice and sing (Johnson) This suggestion is for those readers in the USA, where this song speaks about liberation of those who were in slavery in that country. Lyrics and tune sample. TiS 657 / CH263 / VU700 / AA50 / CP(E) 447 / Cha656 / SP242 God of freedom God of justice (Murray / Guthrie Foote) Powerful lyrics. Can be sung to either TREDEGAR (new, but not too hard) or PICARDY (very familiar) or RHUDDLAN. Lyrics and midi. New words to old tunes. Tune In / NCYC '07 Forgive us now (Brown). “As we forgive may we be healed, as we reach out….” An excellent ballad. Lyrics and sound sample. VU699 / GtG772 / PH332 Live into hope of captives freed. Excellent words from Jane Parker Huber to the familiar tune TRURO. Lyrics. New words to old tunes. NCH317 Make a gift of your holy word / Mikotoba o kudasai (Imakoma) Touching and mournful song seeking God's presence and the coming of justice. The tune is Japanese, and very beautiful. It would be best sung, at first, by a soloist with simple accompaniment. You could also use an Alleluia as a Psalm refrain. 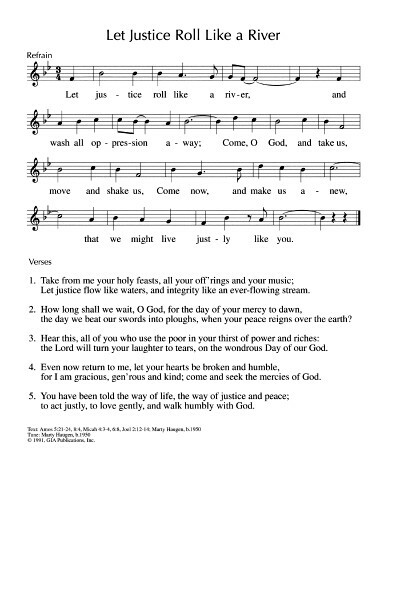 PfAS113A / MP163 From the rising of the sun (Wonson Eddy) A fun and joyful Psalm response. CH169 / VU245 / SFFS 2020 / HPP26 / CP309 Praise the Lord with the Sound of Trumpet (Sleeth) Fun. Good for kids. Good if you have extra instruments at your worship service. Online Resource From the rising of the sun (Harding) A simple contemporary Psalm refrain. SiS?? From the rising of the sun (Deming) An old chorus that will be familiar and fun for older congregations; it is not at all inclusive. This is particularly excellent in churches that face North or South, because then you can get the whole congregation doing jazz hands above their heads going East to West. Surely my childhood church (One Tree Hill Uniting) was not the only church to do this in the '70s? Rock on to this version on Youtube. Oldy-but-a-goody. *ATAR676 Lord, be the rising (Sears) This is quite lovely. The tune is simple and the words seek God in all goodness. Pray for everyone, including national leaders; Christ our mediator. TiS 285 / VU363 / STB187 Your coming Lord to earth in Bethlehem Tricky, but good solid words and images. Verse 4 is particularly good if you are celebrating communion, and could be omitted if you don’t like to sing songs about communion when you are not celebrating it. The dishonest and shrewd manager; honesty, faithfulness. ATW 498 / Iona (T1AU) / MV 196 / SP&P182 / URW438 We will take what you offer. An excellent simple short song that works well either as an upbeat chorus or as a reflective chant. "We will take what you offer. We will live by your word. We will love one another. And be fed by you Lord". Good for kids. Sound sample. Online resource To be faithful (Bruxvoort-Colligan) This is a very simple, catchy short song about being faithful with what you are given. Note to BUC people, I have a copy of this book. Sound sample, lyrics and songbook. Online resource Forgive us God for all the things we waste (Murray) Excellent, tough words. I would prefer this sung to a more reflective tune as a hymn for forgiveness, but haven't found a better tune than the one set. Sheet music. NCH562 / AA127 / Cha381 Take my gifts and let me love you (Murray) Good words about giving God ourselves, our goods, our money. Can be sung either to the set tune by Colin Gibson (TALAVERA TERRACE) which is a little tricky, or the more well known tune HOLY MANNA (New words to old tunes). A good offering song. Lyrics. What ideas do you have? Please share them below!